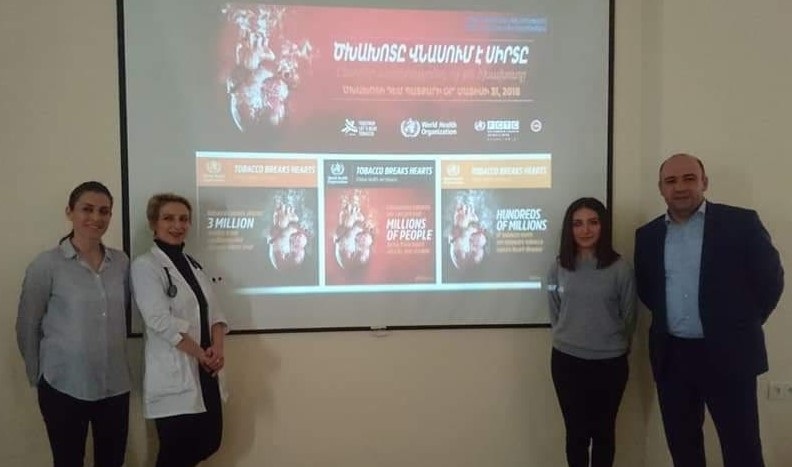 YEREVAN, Armenia – On November 21, in the scope of the long-standing collaboration between the Turpanjian School of Public Health (SPH) of the American University of Armenia (AUA) and the Nork Marash Medical Center (NMMC), Senior Researcher Arusyak Harutyunyan and Research Assistant Varduhi Hayrumyan delivered a talk to a professional audience of cardiologists on the burden of tobacco use in Armenia, particularly among cardiac patients, and the role of healthcare providers in tobacco dependence treatment. 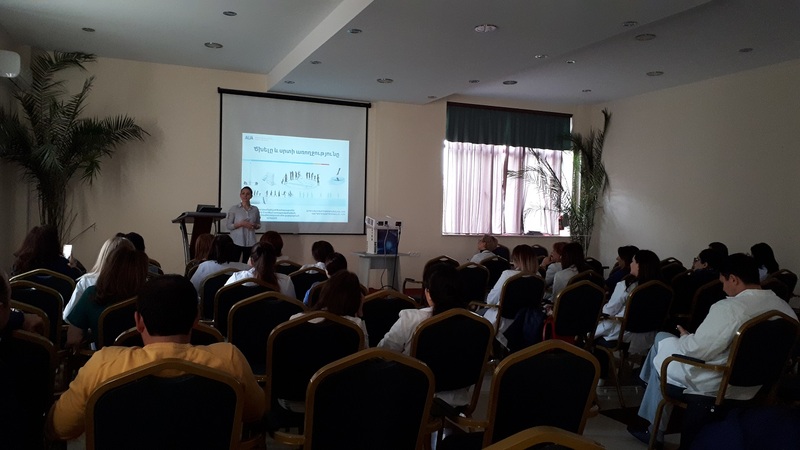 In their talk, the researchers presented the key findings of a study conducted at NMMC in 2016 that explored the smoking cessation practices and the factors associated with smoking cessation at six to twelve months after hospitalization among smoker patients diagnosed with myocardial infarction. 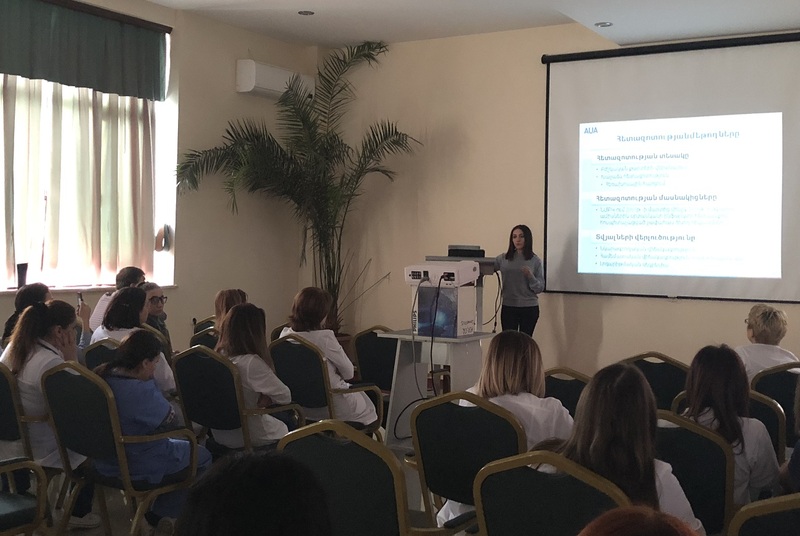 The research was initially conducted in the scope of Varduhi Hayrumyan’s (MPH ‘16) master’s project, then continued as a project of the Avedisian Onanian Center for Health Services Research and Development (CHSR). The research findings were extensively disseminated to a wide audience of professionals, advocates, leaders, and scientists working in tobacco control. During the meeting the NMMC and CHSR representatives discussed opportunities to extend the existing partnership between the institutions and to implement a project on incorporating tobacco dependence treatment services into medical care of cardiac patients at NMMC. 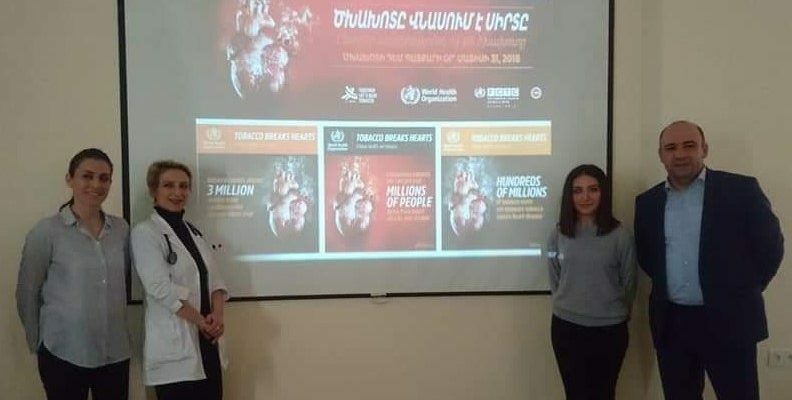 Dr. Mikael Adamyan, Interim Director of NMMC, emphasized the leading role of CHSR in tobacco control and expressed enthusiasm to collaborate with CHSR for combating the tobacco epidemic among cardiac patients. The event was organized to join the American Cancer Society’s annual “Smokeout” day, which takes place every third Thursday of November starting 1970’s. Events celebrating “Smokeout” day are designed to challenge smokers to quit smoking and to raise the awareness about practical tools to help with smoking cessation.